Get 4 Hot & Crispy, 4 Boneless Strips and 1 Dip at KFC. KFC 4+4 to get 4 Hot & Crispy, 4 Boneless Strips and 1 Dip at just Rs 360. A limited Period offer, This offer cannot be redeemed for cash or clubbed with any other offer or promotion. No KFC coupon code is required to redeem this offer. Order now!!! Hurry Up!!! Order KFC online & get 12 Piece Boneless Chicken Strips + 4 Dips at just Rs.350. Grab 10 pieces Hot & Crispy Chicken + 6 pieces Boneless Strips + 2 Pepsi Cans at just Rs 599 only. Offer valid only on wednesdays. No coupon code required. Offer valid for Pune customers. Limited period offer!! Buy Now. Save 42% with KFC's 12 tender, juicy Boneless strips with four signature KFC dips. A small price for a big dip, Valid on dine-in, takeaway & delivery orders. Limited Period Offer, Hurry Up!!! Save 43% with KFC's Hot, Crispy&SmokyGrilled, 8pc Boneless and 8pc Hot wings chicken, Valid on dine-in, takeaway & delivery orders. Crispy,4pc Hot, Crispy and4pc SmokyGrilled. Limited Period Offer, Hurry Up!!! Offer valid on 2 chicken [email protected] worth Rs 300. Offer cannot be redeemed for cash or clubbed with any other offer. No KFC coupon code is required to redeem this offer. Limited Period Offer, Hurry Up!!! KFC is offering a FLAT 15% OFF ON Orders Of Rs. 500. This offer is valid for delivery option only. Use the KFC coupon code for redeeming the offer now! This is a Limited Period Offer. So Hurry and Order Now! KFC great offer, Get flat Rs.75 Cashback. Pay using Airtel Money Wallet / Airtel Payments Bank and receive flat Rs 75 cashback on min. transaction of Rs 600 (Inc tax). This offer cannot be redeemed for cash or clubbed with any other offer or promotion. No KFC coupon code is required to redeem this offer.Order now!!! Save 46% with KFC's cricket special! 4pc Hot & Crispy, 8pc Boneless and 6pc Hot wings chicken, Valid on dine-in, takeaway & delivery orders. Crispy, 8pc Boneless and 6pc Hot wings chicken. Limited Period Offer, Hurry Up!!! Make your day a delicious one with KFC popular 5-in-1 Zinger Boxavailable only at Rs.229. Prepared with the extra delicacy of 100% real veggies, topped with iceberg lettuce & eggless mayo, served in a soft corn bun which will surely add an extra flavor to your day meal. Get this cuisine with such reasonable price from KFC and no KFC coupon code is required .Order today and behold the joy of deliciousness!!! Be part of KFC special offer on chicken items where you can redeem a two pcs of Hot & Crispy Chicken only atRs 649. Offer valid on purchase of Longers, Zingers, Rockin, Crunchy, 5in1 boxes & Rice Bowls and not valid across all Airport Stores & Medicity Gurgaon.This offer cannot be redeemed for cash or clubbed with any other offer or promotion. No KFC coupon code is required to redeem this offer. Order now!!! Offer valid on net purchase of 12 pices KFC chicken worth Rs 350.Offer cannot be redeemed for cash or clubbed with any other offer. No KFC coupon code is required to redeem this offer. Limited Period Offer, Hurry Up!!! Be part of KFC special offer on chicken items where you can redeem Variety bucket with your 2 favourite chicken snacks in 1! (3pc Boneless Strips & 6pc Hot Wings). This offer cannot be redeemed for cash or clubbed with any other offer or promotion. No KFC coupon code is required to redeem this offer. Order now!!! Be part of KFC special on chicken items where you can redeem Smoky Grilled Chicken is juicy chicken marinated in a signature smoky sauce and grilled to perfection, topped with the unique mouthwatering chipotle garlic glaze. No KFC coupon code is required to redeem this offer. Order now!!! Get A meal put together for buddies! Enjoy 4pc of smoky with 4pc of Boneless chicken strips and 2 pepsi cans to quench your thirst at KFC only. This offer cannot be redeemed for cash or clubbed with any other offer or promotion. No KFC coupon code is required to redeem this offer. Order now!!! All that's good about KFC in one big meal. 3pc Hot and Crispy + 3pc Hot Wings + 3pc Boneless Strips + Large popcor and 2 pepsi can, This offer cannot be redeemed for cash or clubbed with any other offer or promotion. No KFC coupon code is required to redeem this offer. Order now!!! Save 43% with KFC's cricket special! 4pc Hot andOffer NOT valid across all Airport Stores & Medicity Gurgaon Offer valid till 31st May 2018 . Valid on dine-in, takeaway & delivery orders. Crispy, 8pc Boneless and 6pc Hot wings chicken. Limited Period Offer, Hurry Up!!! offer valid on net purchase of pices chicken worth Rs 450.Offer cannot be redeemed for cash or clubbed with any other offer. Pay using Airtel Money Wallet / Airtel Payments Bank and receive flat Rs 75 cashback on min chicken or promotion being run by Yum Restaurant India. Limited Period Offer, Hurry Up!!! Offer valid on net purchase of 18 pices chicken worth Rs 499.Offer cannot be redeemed for cash or clubbed with any other offer. Save 43% with KFC's cricket special! 4pc Hot & Crispy, 8pc Boneless and 6pc Hot wings chicken or promotion being run by Yum Restaurant India. Limited Period Offer, Hurry Up!!! Buy 6 pc of Smoky Grilled Chicken & get 50% off Smoky Grilled free, Offer NOT valid across all Airport Stores & Medicity Gurgaon. Offer valid . Offer is valid only on delivery orders. Offer valid on purchase of 6 pc of Smoky Grilled Chicken on Friday only, Hurry Up!! 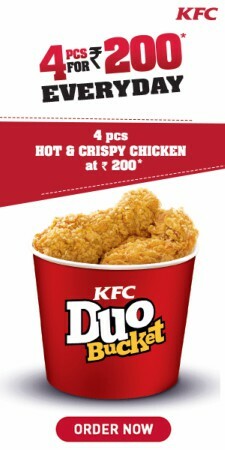 Get 2 pcs Hot & Crispy at Rs.110 only at KFC. Offer valid on purchase of Longer, Zinger, Rockin, Crunchy, 5in1 boxes & Rice Bowlz, Offer valid on Dine-in & Takeaway orders only. Limited Period offer, Hurry Up!!! Offer valid on net purchase of food worth Rs 400(excluding Popcorn). Offer valid till delivery only till 31st March 2018 Offer cannot be redeemed for cash or clubbed with any other offer or promotion being run by Yum Restaurant India. Limited Period Offer, Hurry Up!!! Buy 6 pc of Smoky Grilled Chicken & get 3 pc Smoky Grilled free, Offer NOT valid across all Airport Stores & Medicity Gurgaon. Offer valid till 31st March 2018. Offer is valid only on delivery orders. Offer valid on purchase of 6 pc of Smoky Grilled Chicken on Friday only, Hurry Up!! KFC great offer, Get flat Rs.75 Cashback. Pay using Airtel Money Wallet / Airtel Payments Bank and receive flat Rs 75 cashback on min. transaction of Rs.450. This offer cannot be redeemed for cash or clubbed with any other offer or promotion. No KFC coupon code is required to redeem this offer.Order now!!! Be part of KFC special offer on chicken items where you can redeem a 10-Pcs for Rs.500 only at KFC online store. This offer cannot be redeemed for cash or clubbed with any other offer or promotion. No KFC coupon code is required to redeem this offer. Order now!!! Be part of KFC special offer on chicken items where you can redeem a 4-pcs of Hot & Crispy Chicken, 4-pcs of Smokey Grilled Chicken with a special discount save Upto 37% Off on Half-n-Half. This offer cannot be redeemed for cash or clubbed with any other offer or promotion. No KFC coupon code is required to redeem this offer. Order now!!! Be part of KFC special offer on chicken items where you can redeem a two pcs of Hot & Crispy Chicken only at Rs.599. Offer valid on purchase of Longers, Zingers, Rockin, Crunchy, 5in1 boxes & Rice Bowls and not valid across all Airport Stores & Medicity Gurgaon.This offer cannot be redeemed for cash or clubbed with any other offer or promotion. No KFC coupon code is required to redeem this offer. Order now!!! Be part of KFC special offer on chicken items where you can redeem a 5 items in 1 meal box at rs.199, now you can get two pcs of Hot & Crispy Chicken, Burger, Chocolate Cake and Pepsi. This offer cannot be redeemed for cash or clubbed with any other offer or promotion. No KFC coupon code is required to redeem this offer. Order now!!! Be part of KFC special offer on chicken items where you can get new smoky grilled wings, Hot & Crispy Chicken only at KFC, This side item is prepared with utmost delicacy and subtle flavours that will delight you uniquely.No coupon code is required to redeem this offer.Order now and enjoy your treat. Be part of KFC special offer on chicken items where you can redeem a two pcs of Hot & Crispy Chicken only at Rs.500 For 10 Pcs. Offer valid on purchase of Longers, Zingers, Rockin, Crunchy, 5in1 boxes & Rice Bowls and not valid across all Airport Stores & Medicity Gurgaon.This offer cannot be redeemed for cash or clubbed with any other offer or promotion. No KFC coupon code is required to redeem this offer.Order now!!! This weekend treats yourself with best sides items from KFC online store.Place an order for popular 12 pcs of boneless chicken strips which you can redeem at only Rs.350.This side item is prepared with utmost delicacy and subtle flavours that will delight you uniquely.No coupon code is required to redeem this offer.Order now and enjoy weekend. Be part of KFC special offer on chicken items where you can redeem a two pcs of Hot & Crispy Chicken only at Rs.110For 2 Pcs. Offer valid on purchase of Longers, Zingers, Rockin, Crunchy, 5in1 boxes & Rice Bowls and not valid across all Airport Stores & Medicity Gurgaon.This offer cannot be redeemed for cash or clubbed with any other offer or promotion. No KFC coupon code is required to redeem this offer.Order now!!! Be part of KFC special offer on chicken items where you can redeem a two pcs of Hot & Crispy Chicken only at Rs.449. Offer valid on purchase of Longers, Zingers, Rockin, Crunchy, 5in1 boxes & Rice Bowls and not valid across all Airport Stores & Medicity Gurgaon.This offer cannot be redeemed for cash or clubbed with any other offer or promotion. No KFC coupon code is required to redeem this offer. Order now!!! KFC is offering a Large Popcorn for Rs 130 on cheques above Rs 400. This offer is valid for delivery option only. This is a Limited Period Offer. So Hurry and Order Now! KFC is offering a FLAT 15% OFF ON Orders Of Rs. 500. This offer is valid for delivery option only. This is a Limited Period Offer. So Hurry and Order Now! Be part of KFC special offer on chicken items where you can redeem a two pcs of Hot & Crispy Chicken only at Rs.599. Offer valid on purchase of Longers, Zingers, Rockin, Crunchy, 5in1 boxes & Rice Bowls and not valid across all Airport Stores & Medicity Gurgaon.This offer cannot be redeemed for cash or clubbed with any other offer or promotion. No KFC coupon code is required to redeem this offer. Offer valid till 15th February 2017. Order now!!! Be part of KFC special offer on chicken items where you can redeem a two pcs of Hot & Crispy Chicken only at Rs.449. Offer valid on purchase of Longers, Zingers, Rockin, Crunchy, 5in1 boxes & Rice Bowls and not valid across all Airport Stores & Medicity Gurgaon.This offer cannot be redeemed for cash or clubbed with any other offer or promotion. No KFC coupon code is required to redeem this offer. Offer valid till 15th February 2017. Order now!!! This Wednesday treats yourself with best sides items from KFC online store.Place an order for popular 10 pcs of chicken strips which you can redeem at only Rs.500.This side item is prepared with utmost delicacy and subtle flavors that will delight your uniquely.No coupon code is required to redeem this offer.Order now and enjoy Wednesday. This weekend treat yourself with best sides items from KFC online store.Place an order for popular 12 pcs of boneless chicken strips which you can redeem at only Rs.350.This side items is prepared with utmost delicacy and subtle flavours that will delight you uniquely.No coupon code is required to redeem this offer.Order now and enjoy weekend. Be part of KFC special offer on chicken items where you can redeem a two pcs of Hot & Crispy Chicken only at Rs.200. Offer valid on purchase of Longers, Zingers, Rockin, Crunchy, 5in1 boxes & Rice Bowls and not valid across all Airport Stores & Medicity Gurgaon.This offer cannot be redeemed for cash or clubbed with any other offer or promotion. No KFC coupon code is required to redeem this offer. Order now!!! Your Monday meal will be a delicious and awesome one with food order from KFC online store as you get a 12 pcs of crispy chicken strips from this restaurant at only Rs.300.This tender, crispy and juicy boneless strips of chicken are surely going to be the best treat for your friends and families.So, grab this offer before it expires. Order Soon and no KFC promo code are required to redeem this offer.Enjoy with deliciousness!!! 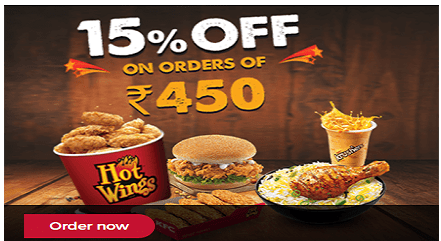 KFC is offering a FLAT 15% OFF ON Orders Of Rs. 450. This offer is valid for delivery option only. This is a Limited Period Offer. So Hurry and Order Now! This Wednesday redeem a special offer from KFC where you can get 10 Pcs of hot and crispy chicken only for Rs.400. Offer valid only on Wednesday order and cannot be redeemed for cash or clubbed with any other offer or promotion.Enjoy this tender, crispy, and boneless chicken today from KFC at such low price. No KFC coupon code is required to redeem this offer.Offer gonna expires soon. So, order today and enjoy Wednesday like never before.Hurry up!!! This Weekend make a party breakout for your friends or families with KFC best offer of delivering you the delicious Popcorn chicken only at Rs.99. Offer valid on net purchase of food worth Rs.350 (excluding Popcorn). Offer valid on delivery only till 15th Feb, 2017. This offer cannot be claimed with any other offer or promotions. Order this popcorn chicken once to get a taste of KFC Deep fried chicken cubes coated with masalas and parmesan cheese powder..No KFC promo code is required for this offer.Enjoy weekend.!!! Order Delicious food cuisine From KFC online store for Rs.450 & above and get flat 15% discount on your purchase value. This offer is applicable on all KFC food items ranging from chicken, burgers, rice Bowlz, desserts and sides items.A maximum discount of Rs 1000 can be availed through this offer and offer cannot be clubbed with any other offer.Offer gonna expires soon. Use above mentioned KFC coupon code at checkout page to redeem this offer. Hurry up offer expires soon!!! KFC is offering you a hot Wednesday deal on whole meal of Hot & Crispy Chicken bucket With Sides Items which you can avail only at Rs.599. This amazing meal gives you to taste from famous 10 Pcs hot & crispy chicken bucket with 6 Pcs chicken hot wings and 2 Pepsi cans to quench all your thirst. Get this amazing meal which can be put together for your friends and family at such best price. No KFC coupon code is required to grab this offer. Order today and enjoy!!! Celebration at office is now more fun with the KFC exclusive office hours offer! Order the mouth watering food from KFC and get a maximum of 20% discount on all your orders. The offer is valid for a minimum order value of Rs. 3500. Use the KFC coupon code for redeeming the offer now! Redeem a special offer from KFC online store where you get fiery chicken or 2 pcs of hot & crispy chicken only at Rs.99.Offer gonna expires soon.So, use above mentioned KFC coupon code at checkout page and redeem such delicious and best-made chicken items at such reasonable price. Order soon!!! Be part of KFC special offer on chicken items where you can redeem a two pcs of Hot & Crispy Chicken only at Rs.110. Offer valid on purchase of Longers, Zingers, Rockin, Crunchy, 5in1 boxes & Rice Bowls and not valid across all Airport Stores & Medicity Gurgaon.This offer cannot be redeemed for cash or clubbed with any other offer or promotion. No KFC coupon code is required to redeem this offer. Offer valid till 15th February 2017. Order now!!! Your Monday meal will be a delicious and awesome one with food order from KFC online store as you get a 12 pcs of crispy chicken strips from this restaurant at only Rs.469.This tender, crispy and juicy boneless strips of chicken are surely going to be the best treat for your friends and families.So, grab this offer before it expires. Order Soon and no KFC promo code are required to redeem this offer.Enjoy with deliciousness!!! This weekend treat yourself with best sides items from KFC online store.Place an order for popular 6 pcs of boneless chicken strips which you can redeem at only Rs.195.This side items is prepared with utmost delicacy and subtle flavours that will delight you uniquely.No coupon code is required to redeem this offer.Order now and enjoy weekend. Friday always bring best food offer from Popular KFC restaurant. Such a best food offer is on popular Mingles Bucket which you can redeem at only Rs.199.This bucket gives you to taste from both favourite Hot Wings & Boneless Strips chicken snacks.Adore the taste from this both chicken snacks which will delight you with unique deliciousness.No KFC coupon code is required to redeem this offer.Order now and celebrate!!! Start ordering the latest added 6pcs of Nashville Chicken Item with Pepsi can from KFC online store at only Rs.499.This chicken item is prepared with Crispy chicken coated with a unique new Nashville sauce topped with tangy American pickles which are surely gonna amuse you and will make your Friday an awesome one.No KFC promo code is required to redeem this offer. No limitation is there for this offer. So, order now and enjoy!!! Try out the new friendship Bucket meal from KFC online store which is available only at Rs.529. This bucket includes 3 Pc Hot Wings, 3 Pc Boneless Strips, Popcorn Chicken, and 3 Pc Hot & Crispy Chicken,2 Pepsi cans at such reasonable price. So, what to desire more? Get this bucket for any special occasion or parties and enjoy the party time with extra deliciousness. No KFC coupon code is required. Order now!!! Make your Monday a veggie one with KFC popular 5 Pcs Veg Strips snacks which you can redeem with only at Rs.99. This veg strip which is made of from a blend of vegetable is one of the favourite snacks items prepared with rich ingredients and delicious flavour. Redeem this 5 pcs of golden crispy mixed veg fingers at such low price from KFC. No KFC coupon code is required to redeem this offer. Order today and enjoy!!! This weekend celebrate the new year with your best buddies and loved ones and don't forget to order KFC special smoky duo bucket meal with only at Rs.439.This meal gives you to taste delicious combination of 4 pcs smoky grilled chicken,6pcs of chicken wings and 2 pepsi cans at such reasonable price.No KFC coupon code is required to redeem this offer.Order now!!! Are you planning for a grand new year party? Then take a look at KFC House Party where you can get flat 15% off on minimum bill value of Rs.1000 and above.A maximum discount of Rs 1000 can be availed through this offer and offer cannot be clubbed with any other promotions. Offer valid till 15th Feb, 2017.. All major cards are accepted during checkout. No KFC coupon code is required to redeem this offer. Order Now and enjoy the weekend!!! Get ready to order delicious Chicken Rice Bowl from KFC online store with only at Rs.99.Get a complete meal in a bowl, with KFC's exotic rice, flavourful gravy, with a topping of Chicken Popcorn,which is served with Pepsi to quench all your thirst.No KFC promo code is required to redeem this offer. No limitation is there for this offer. So, order now and enjoy meal with delicacy!!! Get your online order placed on American favorite Nashville Rice Bowl from KFC online store which is available only at Rs.135.Get a complete meal in a bowl, loaded with KFC's exotic rice, flavorful gravy, with a topping of Nashville chicken which is the best one you can get.No KFC promo code is required to redeem this offer. No limitation is there for this offer. So, order now and make your Tuesday a special one. Hurry up!!! Get ready to order the 2 Pcs of the American favourite Nashville Chicken items from KFC online store with only at Rs.169. You should ones taste this Chicken item which is prepared with Crispy chicken coated with a unique new Nashville sauce topped with tangy American pickles which are surely gonna amuse you and will make your Monday an awesome one.No KFC promo code is required to redeem this offer. No limitation is there for this offer. So, order now and enjoy!!! KFC has brought something special for your weekend.Order 4pcs of delicious Nashville Chicken items from KFC online store with only at Rs.325. So, this is the most reasonable price to redeem this chicken item which is prepared with Crispy chicken coated with a unique new Nashville sauce topped with tangy American pickles which are surely gonna amuse you and will make your weekend an awesome one.No KFC promo code is required to redeem this offer. No limitation is there for this offer. So, order now and enjoys the weekend!!! Nashville Chicken item are going viral among food lovers for its deliciousness and spiciness.So, now you can also order 6pcs of Nashville Chicken item from KFC online store with only at Rs.479. This chicken item is prepared with Crispy chicken coated with a unique new Nashville sauce topped with tangy American pickles which are surely gonna amuse you and will make your Friday an awesome one.No KFC promo code is required to redeem this offer. No limitation is there for this offer. So, order now and enjoy!!! All the way from Nashville, America the widely favourite Nashville Boneless Chicken item are now available at KFC India online store with only at Rs.315.Prepared from Crispy chicken coated with a unique new Nashville sauce topped with tangy American pickles these Nashville Boneless Chicken items are sure to left you overwhelmed.No KFC promo code is required to redeem this offer. No limitation is there for this offer. So, order now and enjoy!!! America’s hot favourite Nashville chicken item is now available at KFC India online store.Place an order for such an favourite Nashville Rice Bowl & Pepsi meal from KFC online store which you can redeem with only at Rs.128.Get a complete meal in a bowl, loaded with KFC's exotic rice, flavorful gravy, with a topping of Nashville chicken, served with Pepsi to quench all your thirst.No KFC promo code is required to redeem this offer. No limitation is there for this offer. So, order now and enjoy Wednesday!!! KFC's new Nashville Hot Chicken is causing a stir among the food lovers who are overwhelmed by its spiciness and taste.So, now you can also order 8pcs of Nashville Chicken item from KFC online store with only at Rs.599. This chicken item is prepared with Crispy chicken coated with a unique new Nashville sauce topped with tangy American pickles which are surely gonna amuse you.No KFC promo code is required to redeem this offer. No limitation is there for this offer. So, order now and enjoy!!! KFC has presented its Delicious Veg Longer for all veggie lovers out there who can redeem this item only at Rs.55. This veg longer is prepared with a large toasted bun filled with veg strips with additional onions and salads. Surely a good meal to calm your food hunger with the best available price.No KFC promo code is required to redeem this offer. No limitation is there for this offer. So, order now and enjoy!!! Weekend Offer: Buy 6 Pcs Of Smoky Grilled Chicken & Get 3 Pcs Smoky Grilled free. This weekend is gonna be a happy one for all KFC food lovers. As you can order for six pcs of Smoky Grilled Chicken and get three pcs of smoky grilled chicken free. This is the special offer for the weekend(Saturdays & Sundays) only and can be avail on 6 Pcs Smoky Grilled Chicken only.Offer valid till 15th Feb, 2017.and are not applicable at airport stores and Medicity (Gurgaon). All major cards are accepted during checkout. No KFC coupon code is required to redeem this offer. Order Now and enjoy the weekend!!! Want a refreshment from day-long work with some spicy yet delicious chicken items? then why not try out the special Tuesday offer from KFC where you can redeem 4 Pcs of Smoky Grilled Chicken only at Rs.279. This Smoky Grilled Chicken is juicy chicken marinated in a signature smoky sauce and grilled to perfection, topped with the unique mouthwatering chipotle garlic glaze.Avail this smoky chicken and enjoy the delicious time.No KFC coupon code is required.Order soon!!!! This Monday order popular Veg Rice Bowl with Pepsi from KFC only at Rs.120. This rice bowl is prepared with KFC's exotic rice, flavorful gravy, with a topping of Veg. strips. Grab this rice bowl at best price from KFC and make your meal a double joy. No KFC coupon code is required for this offer!!! KFC has brought you a special Wednesday meal for you which you can avail only at Rs.599. This amazing meal gives you to taste from famous hot & crispy chicken bucket with chicken hot wings and Pepsi to quench all your thirst. Get this amazing meal which can be put together for your friends and family at such best price. No KFC coupon code is required to grab this offer. Order today and enjoy!!! Today's meal will be super one if you get 2 Pcs Of Smoky Grilled Chicken as your side dish. Get this 2 Pcs Of Smoky Grilled Chicken from KFC online store with a best online price of the only Rs.149. This grilled chicken is prepared with juicy chicken marinated in a signature smoky sauce and are grilled to perfection topped with unique mouth watering chipotle garlic glaze.Avail this smoky chicken and enjoy the delicious time.No KFC coupon code is required.Order soon!!!! An awesome beverage after the delicious meal is a must!! !get one of such beverage Alphonso Burst from KFC which is available only at Rs.99. This beverage is indulgent, rich fruit Krushers made with real alphonso mango are going to sway your rich taste. Grab one of this product from KFC to get refreshed with the best price.No KFC coupon code is required . Order soon and get delighted!!! Weekend means party time.So,get your party time more enjoyable and delicious with KFC special 8pcs of smoky grilled chicken available only at Rs.525.This grilled chicken is prepared with juicy chicken marianted in a signature smoky sauce and are grilled to perfection topped with unique mouth watering chipotle garlic glaze.Avail this smoky chicken and enjoy delicious time.No KFC coupon code is required.Order soon!!!! KFC Krushers introduces a new Strawberry Storm Beverage which you redeem only at Rs.99. This Crunchy Strawberries with creamy yogurt and icy dairy slush are the best refreshment drinks after an overloaded meal. Grab one of this product from KFC to get refreshed with the best price. Order Soon and no KFC promo code are required for this offer.Enjoy with deliciousness!!! Friendship Bucket is a new launch meal from KFC which is available only at Rs.489.This bucket includes 3 Pc Hot Wings, 3 Pc Boneless Strips, Popcorn Chicken, and 3 Pc Hot & Crispy Chicken at such reasonable price. So, what to desire more? get this bucket for any special occasion and enjoy the party time with deliciousness. No KFC coupon code is required. Order now!!! KFC has a delighted Wednesday offer for you where you can redeem a 5 In 1 Zinger Box only at Rs.169. This zinger box has a complete meal of one box Chicken Zinger, 1 pc veg strip, Lotte choco pie, 2pc Hot chicken wings and Pepsi.So ,what do you want more? Get this cuisine with such reasonable price from KFC and no KFC coupon code is required .Order today and behold the joy of deliciousness!!! Want to order delicious chicken from KFC but have no cash with you? don't worry just do your transaction through Paytm wallet and get up to 15% cashback on your food order. This offer is applicable to all type of food cuisine from KFC restaurant nearby you.All major credit & debit cards are also accepted.No KFC coupon code is required to redeem this offer .Order today and behold the joy of deliciousness!!! Make your veggie Monday a delicious one with KFC popular Veg Zinger available only at Rs.99. Prepared with the extra delicacy of 100% real veggies, topped with iceberg lettuce & eggless mayo, served in a soft corn bun which will surely add an extra flavor to your day meal. Get this cuisine with such reasonable price from KFC and no KFC coupon code is required .Order today and behold the joy of deliciousness!!! Enjoy this weekend with extra delicious Large Popcorn Chicken from KFC which is available only at Rs.149. This large popcorn chicken is packed with Tender,juicy pieces of Hot & Crispy chicken with an extreme sprinkle, that you can pop nonstop!. So, redeem this popcorn chicken from KFC which is available at best reasonable price.No KFC promo code is required for this offer. Order today and behold the joy of deliciousness!!! You can't keep your hand away from today's offer on KFC Delicious 3 pcs of Boneless Strips Chicken available only at Rs.99. This Tender, crispy and juicy boneless strips of chicken will add an extra deliciousness to your day meal.No KFC promo code is required for this offer. Order today and behold the joy of deliciousness!!! Your day meal should be accompanied by some best sides items. So, grab 1 Pc of Hot & Crispy Chicken from KFC only at Rs.75. This is the best online price to redeem such best sides item which is prepared with spicy, crunchy, juicy chicken that sets your taste buds alight.No KFC promo code is required for this offer. Order today and enjoy your meal with deliciousness!!!! Make your Wednesday a delicious and tasty one with KFC special offer of 12 pcs of Boneless Strips Chicken available only at Rs.350.This tender, crispy and juicy boneless strips of chicken are surely going to be the best treat for your friends and families.This is an exclusive Wednesday offer with best online price.Offer valid till 6th January 2017. So, grab this offer before it expires. Order Soon and no KFC promo code are required for this offer.Enjoy with deliciousness!!! KFC Krushers introduces a new Chocopeanut Bolt Beverages Product which you redeem only at Rs.99. This Chocolate cookies and peanut butter topped with sinful chocolate syrup blended are the best refreshment drinks after an overloaded meal. Grab one of this product from KFC to get refreshed with best price. Order Soon and no KFC promo code are required for this offer.Enjoy with deliciousness!!! KFC is offering you a super weekend offer where you can redeem a 3pc grilled chicken free on purchase of every 6pc Smoky Grilled Chicken. This smoky grilled chicken is prepared with juicy chicken marinated in a signature smoky sauce and grilled to perfection,topped with the unique mouthwatering chipotle garlic glaze. Order Soon and no KFC promo code are required for this offer.Happy weekend!!! KFC offers you an appetizing offer of the day where you can order a smoky rice bowl with Pepsi only at Rs.159. This smoky meal has the best mixture of KFC's exotic rice, flavorful gravy with a topping of smoky grilled chicken. Take a trial taste of this chicken rice bowl which gonna surely make you drool over its cooking.No KFC coupon code is required for this offer. A great KFC offer for all veggie lovers out there who can redeem 5 Pieces of Veg Strips only at Rs.99. A best reasonable price to redeem this 5pcs of Golden, crispy mixed veg. fingers which can be best sides items for your day meal. No KFC promo code is required to redeem this offer. No limitation is there for this offer. So, order now and enjoy your meal !!! Make your Tuesday a special one by ordering some delicious and tasty Chicken Rice Bowl With Pepsi from KFC only at Rs.130. You are surely gonna be delighted with this rice bowl taste which is prepared with KFC's exotic rice, flavourful gravy, with a topping of Chicken Popcorn, and served with Pepsi to quench all your thirst. Surely a good meal to calm your food hunger with the best available price.No KFC promo code is required to redeem this offer. No limitation is there for this offer. So, order today and enjoy!!! Make this weekend a delighted one with KFC by ordering 6 Pc of Hot & Crispy Chicken Only at Rs.399. Treat your taste buds to this spicy, crunchy, juicy chicken that sets your taste buds alight. Start enjoying with your buddies and colleagues and no KFC promo code is required to redeem this offer. No limitation is there for this offer. So, order now and enjoy!!! Grab mouthwatering 5 Pc Veg Strips from KFC only @Rs.99. This veg strip is one of the popular snacks items prepared with rich ingredients and tasty flavor. Redeem this 5pcs of Golden, crispy mixed veg fingers at such low price from KFC. No KFC coupon code is required to redeem this offer. Order today and enjoy!!! KFC has brought you a special Wednesday meal for you which you can avail only at Rs.599. this special meal gives you to taste from famous hot & crispy with hot wings and Pepsi to quench all the thirst.Get this amazing meal which is put together for your friends and family at such best price. No KFC coupon code is required to grab this offer. Order today and enjoy!!! Want to have delicious burgers for your day meal with the best price?. then simply place your order at KFC where you can get a Chicken Rockin Burger only at Rs.85. This burger prepared with Juicy, crispy chicken fillet, topped with spicy, creamy 3 pepper mayo and iceberg lettuce, served in a soft Corn burn is surely going to delight your meal. No KFC promo code is required to get this chicken rockin burger at such low price. Order soon !!! This Monday order popular Veg Rice Bowl from KFC only at Rs.89. This rice bowl is prepared with KFC's exotic rice, flavorful gravy, with a topping of Veg. strips. Grab this rice bowl at best price from KFC and make your meal a double joy. No KFC coupon code is required for this offer!!! Treat your taste buds to 6 Pc Tender, crispy and juicy Boneless Strips which is available only at Rs.195. This is a unique weekend treat from KFC on delicious strips of chicken at such reasonable price.No KFC promo code is required for this offer.Order now and celebrate weekend!!! Special offer on KFC's No. 1 fully masaledar snack! Get 4 Pc of Hot Wings from KFC Only @Rs.99. This Chicken wings smeared with a lip-smacking lemon chili flavor are going to be a perfect sides items for your day's meal . No KFC promo code is required for this offer. Order now!!!! Want some delicious meal with the best reasonable price ? then go ahead on placing an order at KFC restaurants where you can avail 5 in 1 - Rice Box Only at Rs.159. This is a special weekend offer to get this rice box which is a complete meal with 5KFC favorites in one box- Rice n Gravy, 1pc hot & crispy chicken, 2pc Hot wings, Lotte choco pie, and Pepsi. No KFC promo code si required for this offer. Want some spicy, delicious combo meal for your friends and family ? then place your order on Wednesday Special Combo meal at KFC which you can avail with Rs.599. This combo meal has lots of hot & crispy chicken with chicken wings and an additional Pepsi to quench your thirst. No KFC promo code is required for this offer. Place an order now and make your Wednesday a special foody one!!! This festive season shares the joy of happiness with your friend by ordering friendship bucket meal from From KFC only @Rs.489.This friendship bucket meal has a 3 hot & crispy chicken ,3 pcs Hot wings,3 pcs boneless strips and popcorn chicken to make your day delicious. No KFC promo code si required for this offer. Order now!!! This weekend is surely gonna be the best week of yours as you can avail 4 Pcs Of Hot & Crispy Chicken Only at Rs.269. Treat your taste buds to spicy, crunchy, juicy chicken that sets your taste buds alight.No KFC promo code is required for this offer. Hurry up!!! Start enjoying the weekend with KFC as you can avail 6 pcs of smoky grilled chicken only at Rs.425.This is a special offer from KFC for all food lover out there to get this juicy chicken marinated in a signature smoky sauce and grilled to perfection, topped with the unique mouthwatering chipotle garlic glaze at such low price. No KFC promo code si required for this offer. Hurry up!!! This weekend is surely gonna be the best week of yours as you can avail chicken zinger burgers from KFC only at Rs.125. Taste this Juicy, crispy chicken fillet, topped with iceberg lettuce & delicious mayo, served with a soft Corn at such reasonable price which can be redeemed only at KFC.No KFC coupon code si required for this offer. Order now!!! This Wednesday make a party breakout for your friends or families with KFC best offer of Popcorn chicken only at Rs.99. Offer valid on net purchase of food worth Rs.350 (excluding Popcorn). Offer valid on delivery only till 5th Nov 2016. This offer cannot be claimed with any other offer or promotions. Order this popcorn chicken once to get a taste of KFC Deep fried chicken cubes coated with masalas and parmesan cheese powder..No KFC promo code is required for this offer. Make your Tuesday smokier and tastier with ordering from the KFC latest offer of 2 pcs of smoky grilled chicken only at Rs.149. This smoky grilled chicken is prepared with juicy chicken marinated in a signature smoky sauce and grilled to perfection,topped with the unique mouthwatering chipotle garlic glaze. Order Soon and no KFC promo code is required for this offer.Order now!!! KFC offers you an appetizing offer of the month where you can order a smoky rice bowl only at Rs.129. This smoky has best mixture of KFC's exotic rice, flavorful gravy with a topping of smoky grilled chicken. Take a trial taste of this chicken rice bowl which gonna surely make you drool over its cooking.No KFC coupon code is required for this offer. Get ready to order from KFC new addition of smoky grilled chicken and get the best offer of 4 pcs of smoky grilled chicken only at Rs.279. This smoky grilled chicken is prepared with juicy chicken marinated in a signature smoky sauce and grilled to perfection, topped with a unique mouthwatering chipotle garlic glaze. This offer is best for you to enjoy this weekend with double joy. Order Soon and no KFC promo code is required for this offer. This weekend have a special enjoyment with best buddies and don't forget to order from latest arrival of KFC smoky duo meal only at Rs.439. This smoky meal has 4 pc of smoky grilled chicken with 6pc of Boneless strips and 2 pepsi cans to quench your thirst. Order this meal soon from KFC and enjoy this weekend with double joy. No KFC promo code is required for this offer. Get ready to order from KFC new addition of smoky grilled chicken and get the best offer of 8 pcs of smoky grilled chicken only at Rs.525. This smoky grilled chicken is prepared with juicy chicken marinated in a signature smoky sauce and grilled to perfection, topped with a unique mouthwatering chipotle garlic glaze. Order Soon and no KFC promo code is required for this offer. This is one of the special offers from KFC for all chicken lovers as you can get a whole box of chicken rock duo meal only at Rs.299. This duo meal is gonna give you a crispy chicken fillet, topped with spicy, creamy 3 pepper mayo and iceberg lettuce, served on a soft warm bun with a piece of chicken & Pepsi. Avail this huge meal today and no KFC promo code is required to grab this offer. Make your day enjoyable by ordering some tasteful and famous chicken rice bowls from KFC only at Rs.99. This is a great chance for you to order this mouthwatering dish from KFC at such low price. Order today this chicken bowls which is filled with exotic gravy rice and some chicken popcorn topping along with a Pepsi . No KFC promo code is required to grab this offer. This weekend lets the party going on with popular duo bucket meal from KFC which you can avail only at Rs.439. This duo bucket meal can give you 6 PC of boneless chicken strips, 4 PC of hot & crispy chicken, and 2 Pepsi can quench your thirst. Start enjoying with your buddies and no KFC promo code is required to redeem this offer. Firecrackin Fridays Offer: Purchase 6 pc of Fiery Grilled Chicken & Get 3 pc Fiery Grilled free. Great deal on grilled chicken from KFC where you can purchase 6pc of fiery grilled chicken and get 3 PC fiery grilled chicken free.This is an exclusive Friday offer from KFC which cannot be availed on another offer. This offer is valid until 5th November 2016. No KFC coupon code si required grabbing this offer. Make your day more tender and delicious with ordering 12 pcs of crispy chicken strips and 4 tasty dips which you can avail only at Rs.449. Enjoy this tender, crispy, and boneless chicken today from KFC at such low price.No KFC promo code is required grabbing this offer. No limited period is there for the this offer. Start hosting a house party with KFC special offer of flat 15% off on minimum bill value of Rs.1000. You can avail a maximum discount of Rs.1000 on this offer. This offer cannot be redeemed for cash or with any other offer. No KFC coupon code is required for this offer and this avail this offer until 31st December 2016. Good news for all food lovers out there as you can avail an 8pc of tender & Crispy Chicken Only at Rs.499. You can get this offer at Pizza hut make your own bucket where you can add your favourite food from KFC menu at reasonable price. This offer is going to make your day as you can avail such tender & crispy chicken at such low price. No KFC coupon code is required to avail this offer. Good news for all food lovers out there as you can avail an 8pc of Hot & Crispy Chicken Only at Rs.499. You can get this offer at Pizza hut make your own bucket where you can add your favourite food from KFC menu at reasonable price. This offer is going to make your day as you can avail such tender & crispy chicken at such low price. No KFC coupon code is required to avail this offer. Enjoy the most savory and flavoured Mingless bucket meal from KFC only at Rs.199. This bucket has the double flavoured chicken snacks as you get hot wings & boneless chicken strips in 1 meal . Redeem this bucket at such low price and no KFC coupon code is required to grab this offer. Order now!!! Make your day finger licking good with KFC awesome offer of 5 in1 zinger box only at Rs.169. This zinger box has 1 piece chicken zinger, 1pc veg strip, Yumfillz choco pie, 2pc hot wings, and Pepsi. Avail this zinger box today as you can get such a huge meal at such low price. No KFC coupon code is required to grab this offer. Enjoy the Duo meal offer of the day from KFC where you can avail a combo pack of 4 pcs hot & crispy chicken, 6 strips and 2 Pepsi only for Rs.439. Enjoy this best meal offer which is made from 100% chicken and real flavour. No KFC coupon code is required to avail this offer. Order now!!! Grab the delectable duo bucket meal for 2 from KFC @ Rs. 399. Tickle your taste buds with 4pcs hot and crispy, 6pcs boneless strips and 2 Pepsi cans. No KFC coupon code is needed to claim the offer. Order the Wednesday special meal from KFC for flat Rs. 599. Enjoy the juicy hot & crispy, hot wings and Pepsi all in one meal with friends or family. No KFC coupon code is needed to claim the offer. Grab the chicken rock box duo from KFC for flat Rs. 299. Enjoy this amazing meal for 2 people which comes with juicy hot & crispy chicken, an amazing chicken fillet in a sesame bun and a pepsi. No KFc coupon code is needed to redeem the offer. Order the delicious hot wings from Kfc for flat Rs. 99. Enjoy the luscious 4 pcs marinated well in the sauces which is juicy from inside and crispy outside. No kfc coupon code is required to claim the offer. Order the delicious mingles bucket at KFC for flat Rs. 199. Enjoy the palatable hot & crispy chicken and boneless strips in a single bucket. No KFC coupon code is needed to claim the offer. Get this complete meal from KFC, the 5-in-1 rice box for flat Rs. 139. Enjoy the chicken rice and gravy, 2pcs hot wings, 1pc hot and crispy, a yumfillz choco pie and a pepsi. No KFC coupon code is needed to redeem the offer. Grab 4 pcs hot and Crispy for flat Rs. 200 at KFC. Enjoy the crispy, juicy chicken and relish every bite. The offer is valid on all the days. No KFC coupon code is required to redeem the offer. Order the yummilicious dips bucket from KFC for flat Rs. 449 now. Enjoy the flavourful 12 pcs crispy strips of chicken with 4 amazingly delicious dips. No KFC coupon code is needed to redeem the offer. Order the mouth-watering amazing meal specially created for you this Wednesday from KFC for flat Rs. 562. Enjoy the juicy hot and crispy, the crispy chicken wings and Pepsi with your friends or family. No KFC coupon code is needed to claim the offer. Order chicken zinger for flat Rs. 125. Enjoy the crispy and juicy chicken stuffed in a corn bun. Relish every bite engulfed in the goodness of mayonnaise. No KFC coupon code is needed to redeem the offer. Order the supreme duo bucket at KFC for flat Rs. 200. Revel in the flavours of the juicy, crispy and crunchy chicken with every bite. NO KFC coupon code is needed to redeem the offer. Enjoy the yummilicious chicken snacker from KFC for flat Rs. 45. Enjoy the beautiful flavours of the chicken served with thousand island sauce in a hot sesame bun. No KFc coupon code is needed to claim the offer. Order the KFC’s all time classic hot and crispy bucket and get 8 luscious chicken pieces for flat Rs. 499. Treat your taste-buds with excellent chicken and enjoy. No KFC coupon code is required to redeem the offer. Wednesday Wonders: Grab 10Pcs Hot & Crispy Now! Order the lip smacking, delicious hot and crispy chicken bucket from KFc for flat Rs. 400. You get to enjoy 10 yummy chicken pieces. No KFC coupon code is needed to redeem the offer. Order now! Order the delicious friendship bucket meal and enjoy the goodness of the finger lickin good chicken with your friends. Grab everything that is amazing about KFC in one bucket. No kfc coupon code is required to claim the offer. Please your palate with the delicious flavours of KFC food and get Chicken popcorn for flat Rs. 99. The offer is valid for orders worth Rs. 350 or more. No KFC coupon code is required to claim the offer. Order the variety bucket meal at KFC and get one rice bucket with 2 gravy’s, 4pc hot & crispy, chicken strips, 3pcs yumfillz and a pepsi. Satisfy your hunger with this variety bucket. No kfc coupon code is needed to claim the offer. Order the overloaded 5 in 1 Zinger box at KFC for flat Rs. 169. IT makes a perfect KFC meal with the one chicken zinger, 1pc veg strip, 2pcs hot wings, 1 yumfillz choco pie and a pepsi. NO KFC coupon code is required to claim the offer now! Get 8 pieces fiery grilled chicken for Rs. 499. Order this luscious chicken which is well marinated and sizzled in all the flavorful juices while charred in the exterior. No KFC coupon code is required to grab this offer. Order now!! Order the luscious 4 pieces hot & crispy for Rs. 269. Unravel the exquisite juicy, crunchy yummy pieces of chicken and have a wonderful feast experience. KFC coupon code is not needed to redeem the offer. Order 6pcs fiery grilled chicken at KFC and get 3 pcs smoked fiery grilled free! Grab this offer for flat Rs. 399. Revel in the flavours of the luscious chicken. No KFC coupon code is required to avail the offer. Order the perfect group meal for all your get-togethers from KFC for Rs. 535. Treat everyone with 4pcs hot & crispy, 4pcs chicken strips, 6pcs hot wings and beverage of your choice. No KFC coupon code is needed to avail the offer. Order the well marinated and seasoned fiery grilled chicken from KFC for Rs. 499. Relish the 8 pcs of the appetizing chicken. No KFC coupon code is needed to redeem the offer. Order delectable 4pcs hot wings at kfc for flat Rs. 99. Revel in the irresistible flavours from the finger lickin good store. No kfc coupon code is required to claim the offer. Gratify your hunger with the flavourful mingles bucket from KFC for flat Rs. 199. Savour the flavours boneless strips, hot wings and chicken popcorn in 1 bucket. No KFC coupon code is required to redeem the offer now! Order delectable food from the finger lickin good store near your place and get flat 15% discount on your orders. The offer is valid on a minimum bill value of Rs. 350 or more. No KFC coupon code is needed to redeem the offer. Order the delicious veg strips at KFC for Rs. 109. Revel in the flavours of fresh vegetables perfectly cooked in the delicious sauces. No KFC coupon code is needed to redeem the offer. Order the most amazing group meal from KFC for your group of friends or your most loved family for Rs. 460. Delve deeper into the luscious hot&crispy, chicken strips and hot wings with pepsi. NO KFC coupon code is required to redeem the offer. Celebrate the flavours of rich grilled rice bowl for Rs. Rs. 125. Delight in KFC's exotic rice and fiery grilled chicken. It is a complete meal that will excite your palate. No KFC voucher code is needed. Order now! Order the delicious alphonso burst at Rs. 90 at KFC to relish in the flavours of mango. This crusher is a must-have beverage as it is blended with cream, yogurt and icy dairy slush. KFC coupon code is not required to avail the deal. Grab 12 pieces of crispy, crunchy chicken strips for Rs. 449. Further, get 4 tasty tangy dips along with the bucket. Relish completely in the bounty of chicken, each bite more delicious than the last. KFC voucher code is not needed. Order choco peanut bolt at the legendary finger lickin good store at Rs. 99. A must-have beverage at the end of your meal. Enjoy the chocolate cookies, peanut butter, blended with sinful chocolate syrup. KFC coupon code is not required to avail this offer. Order this mouth-watering crunchy large popcorn at Rs. 149 only at the astounding finger lickin store. It goes just plain good as a side to your feast. KFC coupon code is not needed to grab this deal. Order and relish 3 pcs of tender, juicy and crispy boneless strips for Rs. 99 at KFC. No kfc coupon code is required to avail the offer. Book your order right away to get it delivered to your doorstep. Hurry! Delight your taste buds with the grilled rice bowl and pepsi at Rs. 159. Savour the KFC's exotic rice with flavourful gravy and with a fiery grilled chicken piece as a topping. KFC voucher code is not required to avail the offer. KFC is the second largest fast food chain and is headquartered at Louisville. It is the second largest after McDonalds as per billing revenues. . KFC has its restaurant chains in 118 countries that encompass about 19,000 outlets. A subsidiary of Yum! Brands, KFC is a cousin of Pizza hut and the Taco Bell chains. KFC as a venture was the first of the franchising concepts promote by Harland Sanders. The first KFC outlet was established at Utah in 1952. Also KFC was the first to bring chicken to the fast food recipe which was otherwise dominated by the hamburger. Mr. Sander finally sold KFC to an investing business led by John Y Brown Jr and Jack C Massey in 1964. KFC had a bumpy ride in the 1970s and 1980s KFC and changed hands many times before finally finding roots with Tricon Global Restaurants that later was rechristened as Yum! Brands. KFC came to India in 1995 and suffered a huge setback at Bangalore. After the store was mobbed and ransacked, it ran the outlet with police protection for a year. A Delhi outlet was also opened but shutdown after a few weeks. KFC began expanding in 2004 with stores across the country and by the end of 2013; it was running about 400 outlets. Coming out of the predominantly chicken mode, it started flavour localisation and catered to the vegetarian community with the Paneer Burger, Chickpea Burger and hot wings with lemon sprinkles. 2014 saw KFC launch the “So Veg, So Good” advertising campaign that was quite successful. KFC’s menu is quite large and has eleven sections - Group meals, Box meals, Burgers, WOW, Snacks, Share a Bucket, Toasted wraps, Chicken, Rice Bowlz, Krushers and Desserts. All the above categories have about five options to choose from. KFC gives its best to all the recipes and the unique taste in each of these offerings is something all of us appreciate. All chicken items come with Zero Trans-fat and thus quite healthy and nutritious. KFC runs promotions across the year and also has certain daily deals going. The Fiery Friday campaign, where one can get a Fiery Grilled bucket for the half the price is quite popular. Weekly deals like “Weeklong Wing-Athon” are also crowd-pullers. So, check before you order. Ordering online at KFC will get you a 20% off on any day. KFC apps fro Android and iOS are quite popular too and it gives discounts for app orders quite frequently. Please check before ordering. KFC also runs frequent contests on its social media pages. Follow it on social media and you get regular updates. Each contest comes with huge prizes and it is fun to participate. April 2019 - KFC is one of India’s leading fast food destinations and caters to more chicken lovers than anything else. As a part of the recipe localization program, KFC also uses local spices to its recipes in addition to introducing vegetarian dishes on the side in India. KFC already has a great walk-in customer base and most of its customers are in the young category. Additionally, KFC also caters to the doorstep customers by taking in orders through the phone or online. To promote sales, KFC from time to time comes up with great offers through giving our coupons and deals. To the left you can find a list of the current KFC coupons and deals that you can use to get discounts while ordering. Choose the KFC coupon or deal that you want and order from the KFC tab that opens. The deal is automatically applied and you will find the discount or the freebie on your checkout page. Use KFC coupons and deals and save money, especially while ordering big.